Welcome to the Phoenix Shooters Association. We are a small, friendly target shooting club serving the Cheshire, Wirral and North Wales area of the UK. We are both proud and sorry to say that our membership books are full at the moment, and we have a waiting list. However, that does not stop anyone who would like to come along to see what we are about – just contact us through (oddly!) our “Contact us” page – we’re always happy to oblige, and we’ll always reply as soon as we can. The Phoenix Shooters Association (PSA) was formed in 1977. Roy Williams (a police scenes of crime detective ) and several other target shooters were disillusioned with the clubs they were members of, and so banded together to form a new club which would better suit their needs. They wanted a club which was friendly, and wasn’t concerned with “winning at all costs” – in effect a club where sportsmanship and good fellowship were important. When Roy left the club he was with to form this new club, he was told that “it would all end in ashes” which gave him the idea for the name – Phoenix. In those days the members were largely police officers, members of the legal professions and engineers – an odd mixture, but one that worked, as they all had the same object in mind – to support each other, and to both promote the sport and enjoy it. The very first Phoenix shoot on the 1st January 1978 was (to put in mildly) inauspicious: Three people attended Sealand ‘A’ Range, and to quote the range log “Thick snow, shot for 1/2 hour then gave up.” From this humble beginning the PSA was born – and it was named well. Many difficulties, such as the notorious 1988 and 1997 Firearms (Amendment) Acts did great damage to the sport, and shortly after this last piece of iniquitous legislation Roy died – a bad day for Phoenix. Roy had by that time asked Mike and Mary Eveleigh if they could take over some of the running of the club, so there was some continuity. Soon after that the club lost the use of the Guinea Gap range in Wallasey due to political expediency, then the only other range the club used – Sealand Range – was threatened with closure. The club lobbied hard to retain the range, and successfully thank goodness. Following the loss of the Guinea Gap range, and worse still the loss of the sport of pistol shooting, we looked around to see how we could improve things for our members, and clay pigeon shooting came top of the list. 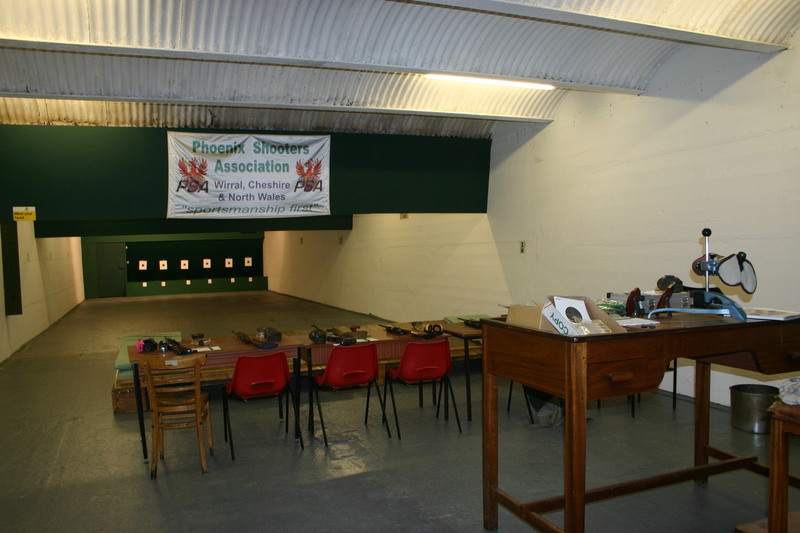 We tried several different areas, some commercial, some not, but during this time the North Wales Shooting School were VERY helpful to us – http://www.nwshootingschool.co.uk/ We eventually found our own small clay shooting grounds thanks to the efforts of our members. A little later Mostyn House School in Parkgate were looking to improve their facilities for their shooting team, and so, with the help of the Grenfell Family who ran the school, we converted their second world war air-raid shelter into a .22 rifle range. At the same time we preserved almost all of the artefacts from the air-raid shelter. Then came another disaster – Mostyn House School became a victim of the recession, and had to close. Again the Grenfell family were very kind to us, and we were allowed to continue to use the range until the site was sold – which it was. The developers made it very clear that they did not want a shooting range on (what was now) their land, which they were to develop for housing – so we had to disassemble everything we’d done in the range and move it into storage. 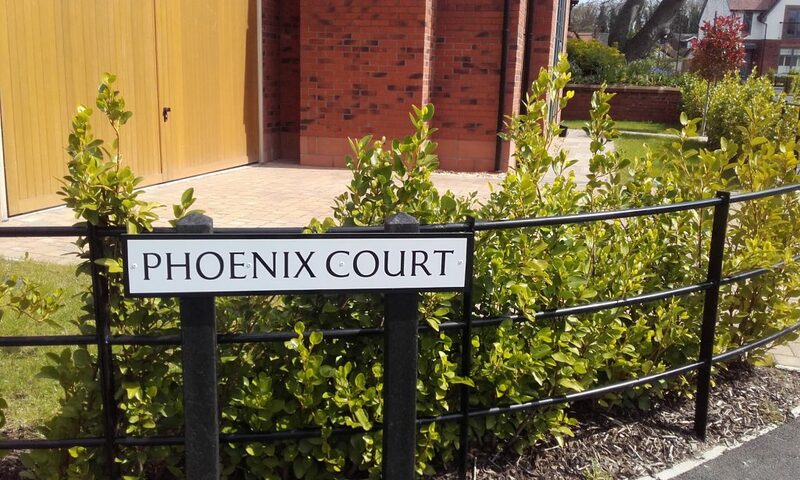 Interestingly, there is now “Phoenix Close” next to where the range once was, so perhaps we’re one of the few shooting clubs to have a road named after us? Thanks to some very helpful members, we can now shoot .22 at the Sheepshed range, and of course we still shoot on the Sealand military ranges, and during the dryer months at Cotton Edmunds. We can now also shoot clays and air rifles at “Phil’s Place” a few days during the winter as well.